I can't believe Christmas is basically a week away and I haven't posted a single festive recipe on here yet. I've been more focused on trying to get all my Christmas shopping done lately as I've had an extra hard time coming up with gift ideas this year and as it's looking now, I likely won't finish shopping until Christmas Eve. Every year I tell myself I'm going to be more organized with everything Christmas-related but every year I end up with a TON of stuff to do last minute. It's kind of part of the holiday rush and excitement though, and at least I usually get good deals by leaving my shopping so late! I do regret not being more organized with holiday recipes though. I had a lot of ideas floating around my head in November but so far I've mainly just been consuming treats that involve eggnog and Kahlua or Baileys, which you don't really need a recipe for! Other than those soft molasses cookies I told you about earlier, these pancakes are the only other festive thing I've made this year. And while I'm disappointed I haven't been doing more cooking/baking, I'm pretty happy that the one thing I made turned out so well! 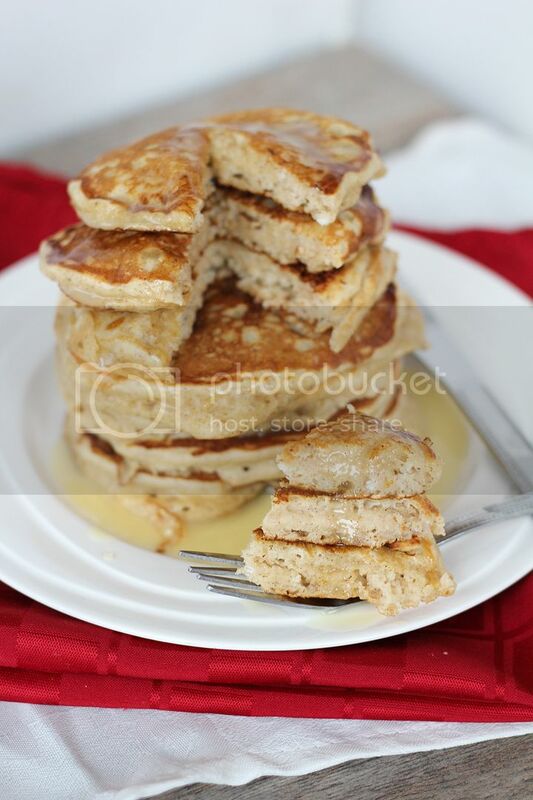 These pancakes are light and fluffy with eggnog in the batter and a pinch of spices to give them a subtle eggnog flavour, but the glaze is what really kicks up the eggnog flavour so you're certain you're eating a festive (and slightly decadent, but not over-the-top) breakfast and not just regular pancakes. So don't skip it! I already can't wait to make these again for breakfast this weekend, and to hopefully squeeze in some holiday baking before then! First, prepare the pancake batter. Whisk all the dry ingredients (flour, baking powder, salt, nutmeg, and cinnamon) in a large bowl. In a separate medium bowl, whisk together the wet ingredients (eggs, eggnog, oil, and vanilla extract). Add the wet ingredients to the dry ingredients and fold together with a spatula until just combined (batter will be lumpy). Heat a large non-stick skillet or griddle to medium heat and spray with non-stick cooking spray if necessary. Pour pancake batter by 1/4 cup-fulls onto the pan. 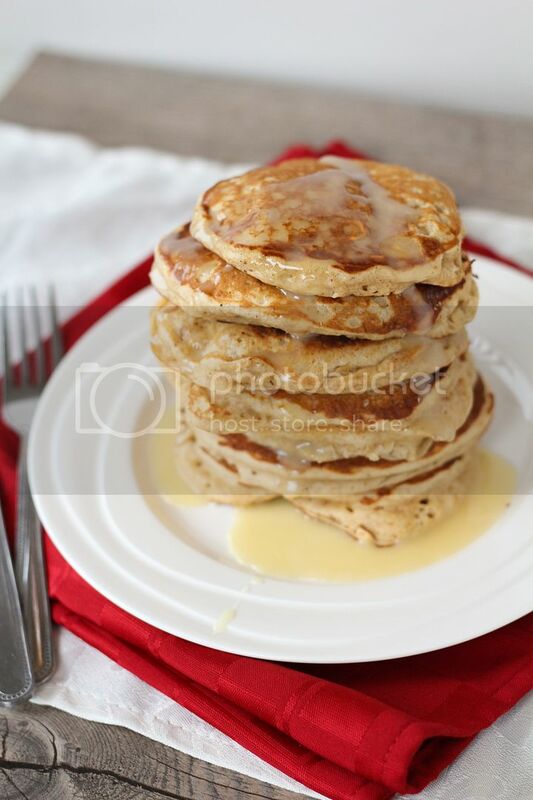 Let cook until bubbles begin to form and pancake is browned on one side, a couple of minutes, then flip and cook until both sides are evenly browned. 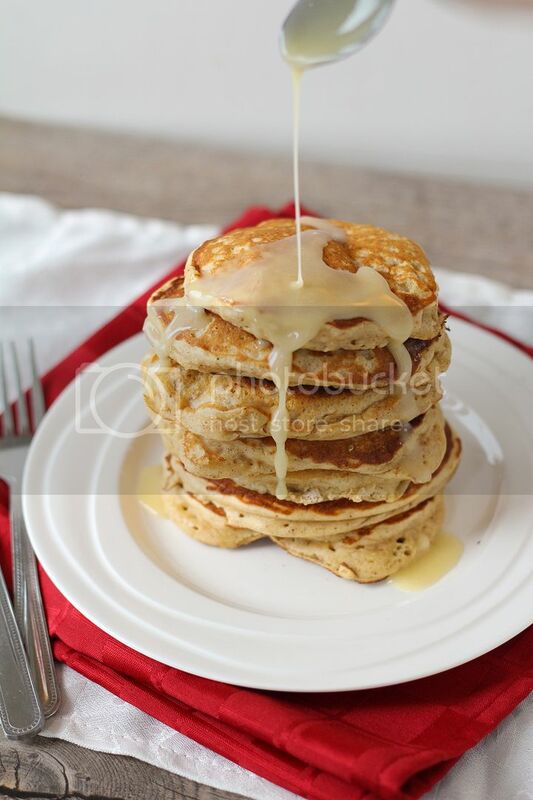 While cooking pancakes, prepare the glaze by whisking all ingredients together in a small bowl. 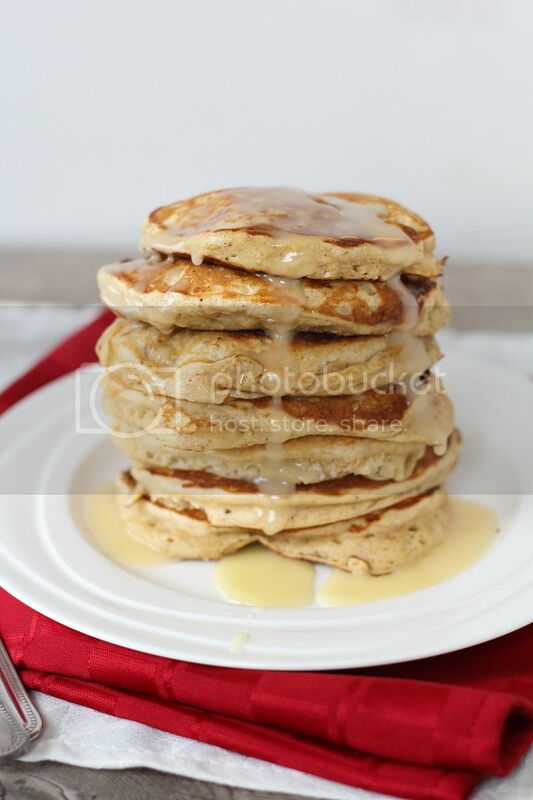 Serve pancakes warm with a small amount of eggnog glaze on top. *Note: The amount of glaze should be just enough for a small amount for each serving. The glaze is quite sweet so you shouldn’t want too much, but feel free to double the amounts for the glaze if you like.